The powerful dance of the Senegalese Compagnie Jant-Bi. 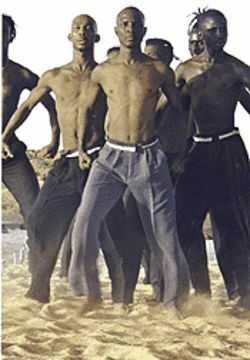 The eight Senegalese men dance with a mind-blowing intensity that disintegrates instantaneously into impishness or hoarse mourning. The powerful score is realized by Etienne Schwarcz using Abdou Mama Diouf‘s drumming and cuts from Shostakovitch. Linke, a 56-year-old blonde who danced with Pina Bausch‘s Tanztheater Wuppertal and directed the Folkwang School (one of the most influential dance schools in Europe) is known for her riveting psychological solos. She had gone to the village of Toubab Dialaw in the inaugural season of a new school for contemporary dance, Jant-Bi, (which means sun) at the invitation of its renowned director, dancer Germaine Acogny. Europe and the dance world know Acogny for running Maurice Bejart‘s modernist dance school in Senegal and her dance Ye’ou, the Awakening — given an award by Time Out London in 1991. She met Linke accidentally in Vienna five years ago, and they became friends and collaborators. The title of Le Coq est Mort is a reference to Senegal’s desire to be free of French colonial “roosters.” But it is also emblematic of a perverse levity that infuses Le Coq — all those involved in the work wanted to kill the roosters that woke them too early each morning before rehearsals. The dancers helped develop Le Coq est Mort‘s movement phrases through improvisation, but there is nothing accidental about the work. While Linke carefully incorporated Jant-Bi’s ideas into her early concepts, her assistant and co-choreographer, Israeli Avi Kaiser, guided them in leaping and falling in the difficult-to-navigate sand which, as their only rehearsal space, became integral to the work. At its U.S. première last August, 10 tons of sand were poured onto the dance floor. No telling how much will be poured on the Gammage stage — or how this troupe was booked here direct from its Kennedy Center appearance on April 6 and 7. Gammage staff was unavailable for interview by presstime. Jant-Bi insisted on keeping the section for its core beauty as well as its technical challenges. The dancers are indeed awesome as they dig deep into our evolutionary roots, reminding us that we are never far away from our origins. The work’s brilliance lies in the intellectual and emotional central message shared by the African, Germanic and Jewish races involved: man’s alienation from the sources of life. Without giving away the ending, Le Coq ultimately shows our commonality and our horrific folly as humans.